Saratoga Jewish Community Arts, through a generous grant from the Jewish Federation of Northeastern New York and the Golub Foundation, presents the Golfstrom quartet at the National Museum of Dance, January 14, at 3:30 pm. Golfstrom is not your average band. The quartet’s front man, singer and accordionist, Sergei Nirenburg, when not engaged in his musical avocation, is a PhD-holding cognitive scientist who helps run a Rensselaer Polytechnic Institute facility known as the Language-Endowed Intelligent Agents Laboratory, home of cutting-edge robotics/artificial intelligence research that could make humans! 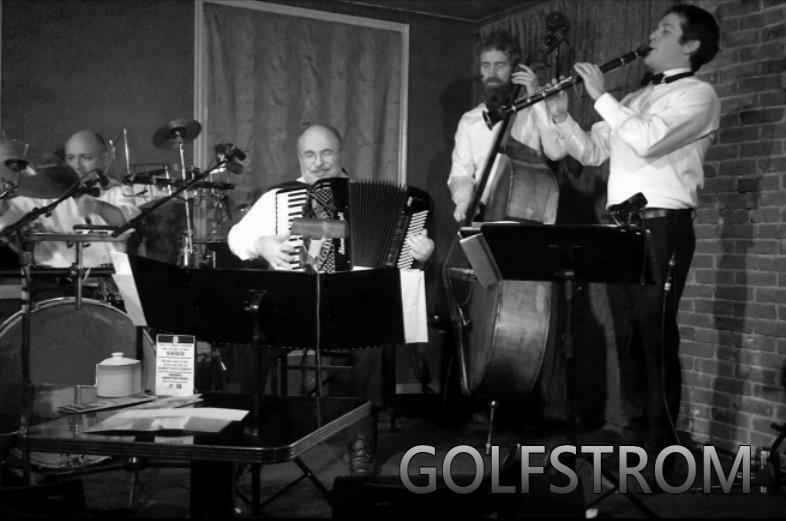 Golfstrom features Nirenburg on accordion and vocals, Jonathan Greene on clarinet, Brian Melick on percussion, and Bobby Kendall on string bass. Greene is an active jazz, world, and classical multi-instrumentalist. He had the honor of playing with groups that opened for Jay Leno at Proctors as well as Marcus Roberts and Anat Cohen at the Troy Music Hall. Melick is a drummer and multi-hand percussionist, and an educator, author, and designer/manufacturer. Kendall plays string bass as well as acoustic guitar and is a professional singer and songwriter. The quartet brings us on a journey around the world to many strains of music, both old and new. Hear traditional melodies, lullabies, ballads, and standards; klezmer as well as waltzes, tangos, and foxtrots – all inspired or colored by the Jewish musical tradition. They will feature music by Jewish composers and others from Russia, the Ukraine, Germany, France, the United States, Israel, Canada, and Latvia. You will hear singing in Yiddish, Ladino, Hebrew, English, French, and Russian. Golfstrom takes you on musical journeys in time over much of the 20th century and in space between Europe and the Americas. Their musical stories will show how much The Great American Songbook of the 1920s-1960s owes to artists from both sides of the Atlantic. The music will bring you to the bal-musettes of old Paris, interwar Warsaw music halls, the famous Berlin cabarets of the 1920s, concert halls in the old USSR, and the musical cafés of Vienna. Their repertoire includes all-time favorites from the old, wonderful Russian, Italian, and French movies. They recreate the dramatic sound of Buenos Aires’ tango clubs, the joyful and wistful melodies that Gypsy and Klezmer bands used to play at Ukrainian village dances and Jewish weddings. Their gamut ranges from the music of famous popular composers and artists of yesteryear – from Carlos Gardel to Jerzy Petersburgski, from Alexander Vertinsky to Jacques Brel, from Kurt Weill to Zequinha Abreu, from Nino Rota to Astor Piazzolla and beyond. You will hear life stories of these titans of popular music and memorable stories of the nomadic lives of their musical creations. Please feel free to dance when Golfstom is playing — if you feel like it and if there is enough space. They have selected some of the melodies that have been wildly popular at different times and in different places in the hope of recreating some of the atmosphere of those bygone times. Golfstrom will appear at the National Museum of Dance on Sunday afternoon, January 14, at 3:30 pm. A dessert reception is included. $10 donation requested. For information or reservations, please call 518-584-8730 opt. 2, or email office@saratogasinai.org.